You are here: Home / Chapter 7 Bankruptcy / Why Wait To Get Your Car Back In Bankruptcy? Why Wait To Get Your Car Back In Bankruptcy? You’re driving around with full knowledge that you owe the city Chicago hundreds or thousands of dollars due to outstanding parking tickets. They haven’t booted your car yet so you feel that you are avoiding the situation by some sort of lucky happenstance. This may go on for weeks, months or years if you change locations and the city can’t find you. However, the city does seem to find you in the long run. When this happens, your car will be ticketed, booted, towed and impounded. Now all of a sudden you panic, wondering how you’re going to get to work, how you’re going to handle your personal affairs and how you are going to have your freedom to move about the city without your vehicle. This is when you finally call a chapter 13 bankruptcy attorney to seek immediate attention. The filing of a chapter 13 requires a filing fee currently at $310, a petition and schedules filed with the clerk of the United States bankruptcy court and a plan to repay either all or a portion of your debt over a three to five-year period. Your bankruptcy attorney will guide you through the process by conducting an extensive interview with you. The purpose of the interview or intake questionnaire is to determine who you owe, what you own, what you spend per month and what you earn per month in an effort to determine what you can readily pay back on a monthly basis. The case is then filed and you and your attorney will appear before the chapter 13 trustee at a meeting of creditors known as the 341 meeting. By this time your bankruptcy attorney will have already sent notification of your filing to the city of Chicago and any attorney collecting for the city of Chicago with regard to your parking tickets. You will likely recover your vehicle within 1 to 2 days after filing if everything goes smoothly. The key is to have a successful 13 so that your case does not get dismissed. 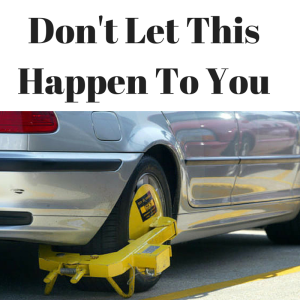 If your case dismisses, the city has the right to reboot your car, tow it and impound it once again. Takeaway: Be Proactive When On The Boot List! The lesson here is a take affirmative action when you know that you are on the boot list and behind with the city of Chicago for parking tickets. Why wait until the city takes your car from you to take action? Why not take the innovative step of getting on top of your situation and proposing a payment plan in advance of your vehicle being impounded? For more help with chapter 13 and to see what you would likely pay per month, contact an experienced bankruptcy attorney in your local area. My office can be reached at 847-520-8100 or 773-276-6969. Lastly, the biggest benefit of chapter 13 with the exception of getting your car back, is that you will likely repay less than what’s owed to the city Chicago over an extended period of time.